The other day one of my colleagues at the Traditional Fighting Arts Forums alerted me to a fellow who calls himself Choson Ninja. He has a series of videos on Youtube and in this particular one he tells you about the dangers of getting "ugly" knuckles from hand conditioning. The general thrust of his argument is correct: conditioning can lead to deformed and ugly knuckles - especially so if you are doing it incorrectly. Certainly, even moderate makiwara practice will cause you to develop callouses. How "unsightly" these are will depend on how much and how "hard" you do your conditioning. However I disagree with Mr Choson about much of what he says in his video. To begin with, his knuckles are not really that conditioned. Rather, they appear to be damaged from breaks. Mr Choson certainly doesn't have anywhere near the kind of callousing one gets from regular conditioning such as striking the makiwara (see the picture below of Don Buck's knuckles, which is quite standard really for many karateka I've known over the years). What conditioned knuckles really look like. Note the callousing. More importantly, I disagree completely with Mr Choson about the notion that you should have 3 knuckles in a row when landing a punch. This is, I feel, a basic and fundamental misconception. Your first 2 knuckles should be in a row. 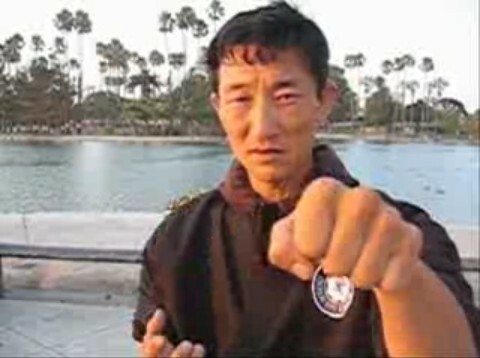 If your third (ring) finger comes into the picture, your forearm and knuckles are no longer properly aligned (as is then clearly demonstrated by Mr Choson in the still below taken from his video). In other words, if you have 3 knuckles in a row you will have a kink in your wrist rather than a straight line from your first 2 knuckles down through your forearm. The incorrect (Choson) alignment of knuckles/fist. On the other hand, having only your 2 primary knuckles in a row makes your forearm line up perfectly with the striking surface: a straight line is created right through your knuckles down your forearm. You can see this (correct) alignment in the adjacent image. When you are striking with great force, correct/optimum alignment is critical - both to land an effective technique and to ensure your own health and safety. I suggest that Mr Choson's own "damaged" knuckles are more the result of incorrect punching than any "conditioning" that he has undergone. I have always maintained that some level of conditioning is important for punching. I recall a friend of mine being attacked in South Africa and punching his way out of his predicament (he was walking home from work late one night and was accosted from the front and rear). He got away, but severely broke his knuckles. Even a moderate amount of conditioning would have averted some of this damage. The face can present a hard and sharp target, depending where and how you land your blow. Not only is the conditioning going to strengthen your knuckles for impact, but the act of conditioning should reinforce correct alignment, further reducing your chances of injury. One of the most basic ways I maintain some level of conditioning is through knuckle push-ups. The importance of alignment is demonstrated in the adjacent images. The top image shows how "not to do it" (note the kink in the wrist), while the bottom shows the correct emphasis on the 2 big knuckles (note the straight line through the forearm). I should add that an important rider this article: the art of wing chun utilises the 2 smaller knuckles and the middle knuckle in its punches. 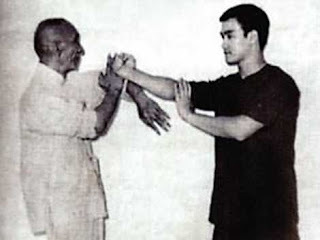 In these punches, the last 3 knuckles are brought to prominence through a twist of the wrist in the course of a "vertical fist" punch (see the adjacent picture of Bruce Lee with Yip Man). This is something I’ve trained in extensively over the years and I can see how it works. Importantly, this is not what Mr Choson is talking about: he's using the first 3 knuckles - not the last 3. On the whole, I don’t favour the wing chun “3 knuckle” as the “standard” method of punching, although I see it as a good secondary weapon (but that probably reflects personal preference). The most common argument I've heard is that the two-knuckle alignment shown in your post places the wrist in a weaker position than the three-knuckle alignment and supposedly increases the risk of injury. This is usually demonstrated by having the student face a wall with an outstretched arm and then taking turns to support his body weight by leaning against the wall: first with the fist in the two-knuckle alignment and then in the three-knuckle alignment. The idea being that the student realizes that the three-knuckle alignment is the more 'natural' of the two. 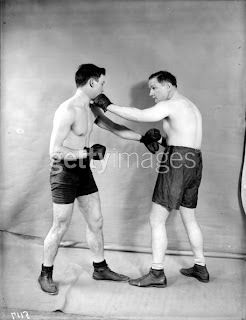 Interestingly enough, I found the exact same exercise in Jack Dempsey's book on boxing. He too emphasized the three-knuckle landings as opposed to two-knuckle landings. There's a copy online here. A boxer's power punches have at least some element of follow-through which creates an arc. This arc exists even on the straight cross. In the arc of the follow-through, the smaller knuckles will be in prominence and will align more naturally than the 2 main knuckles. As discussed in my article "Karate punches vs. boxing punches") I don’t favour follow-through punches for civilian defence. Rather (reflecting my karate/internal arts) background, I favour straight thrusts, which are more conservative (potentially less powerful, but less risky, as is appropriate to civilian defence goals). Regardless of whether I am right in this respect or not, if you practise a traditional eastern martial art like karate, then the boxing fist alignment paradigm simply doesn't apply to you. If you don't like it you can always change to boxing or some similar art. But I don't think you can have it both ways. It is important to remember that boxers have strapped hands and gloves to protect their knuckles. I don’t recommend boxing punches for ungloved (civilian defence) fighting. This is precisely how my friend broke his knuckles while defending himself. The last 3 knuckles are far more prone to breaking on power punches, especially when they are not protected by strapping and padding. I also think that the "lean against the wall test" is misleading: most people who are untrained will find the 3 knuckle more comfortable and “natural” since the force is spread over a wider area. Regardless of the above, note the height at which Dempsey's illustration has you holding your hand: my comments relating to knuckles are intended to apply to punches that are level with your shoulder. Once you raise your arm sufficiently it will be impossible to keep the 2 knuckles in prominence without sharply/unnaturally twisting the wrist downwards. Rather, using a straight fist and Dempsey's angle, the last 3 knuckles will automatically be the first to impact a flat target (as illustrated below). On this subject, note that in Dempsey's illustration the alignment of the knuckles to the forearm is actually identical to that demonstrated by me in the push-up: all that has changed is the trajectory of the punch. Finally it is important to note that the question of what knuckles you use in boxing is largely a moot point: the broad, rounded sweep of the gloves makes it almost impossible (in my experience) to put any particular knuckle in prominence. Rather, you hit with the whole surface of the glove without any thought of the underlying knuckles. The surface of the glove diffuses the blow over the entire fist and any analysis of what knuckles you are using is usually academic. While Dempsey certainly had some important and useful things to say about fighting in general, I am more interested in reading a bareknuckle boxer's perspective on what knuckles one should strike with. Accordingly, my comments on knuckle alignment should be taken in their context: they are appropriate to punching systems that use straight corkscrew thrusts as the default punching method - ie. arts such as karate, taekwondo and the Chinese internal arts. Arts such as wing chun (which involves a fairly unique "vertical fist" punching method) or western combat sports (such as boxing) might have different criteria. Just peeping up to know you are read, and appreciated. I've always been told western boxers hit with the first two knuckles, not the last three...So that's interesting that book you shared with us says differently. I noticed in his books, when reverted to pseudo-boxing techniques, Bruce Lee would also make power punches in a boxing fashion with the three knuckles. In my experience, this can lead to a damaged hand. I've punched solid surfaces firmly with both the three knuckles and the two knuckles. In my experience the two knuckled punch is better to rely on. In order to use the wing chun straight punch without hurting yourself you have to have perfect alignment. I'm glad you took Choson Ninja out and made a real intelligent critique! Everyone else just bashes him for no reason or worships the ground he walks on. There's no way he extensively knows as many arts as he claims to. Everything he does looks like some rehashed Hap Ki Do or Tang Soo Do, but every few videos, he's claiming to teach some new martial art out of no where. Thanks Colin. Yes, Choson is very keen! "So when you're hitting up close like in the wing chun example, you tend to hit with the bottom three knuckles. When you fully extend the hand, and if you seek to hit straight on, then you'll tend to hit with the first two." I agree that with a shorter punch you can hit with the last 3 knuckles, but I certainly don't think you have to. It depends on your trajectory and your target. If you have an upward moment, then you might well hit with the last 3 knuckles. Otherwise I do a 2 knuckle "vertical fist" punch all the time. What distinguishes wing chun is that they add extra force through the twisting action that brings the last 3 knuckles into prominence. 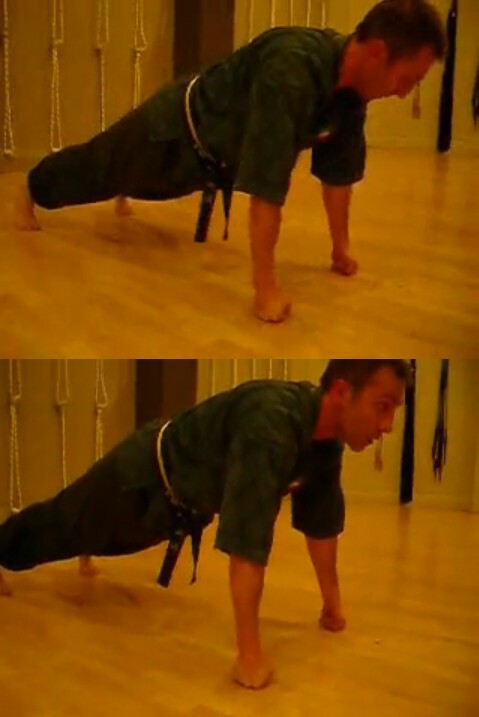 Knuckle push-ups and the makwari are two ways to condition your knuckles. Another is bag punching with just light wraps. I had one TKD instructor who would use cheapo weight lifting gloves -- after 30 or so punches he'd have to stop due to the pain. I also know a kung fu instructor who preaches palms to the hard parts of the body and fists to the soft parts. Personally, I tend to revert to a WC-style punch when in close quarters and punching the body. As for three knuckles vs two, well, I still prefer two for power shots and three for close quarters. Back in my TKD days I flirted with tournament breaks using both a 3" vertical punch (never was brave enough to try the 1" punch in front of a crowd!) and the standard TKD/karate punches. The thing I noticed is that when I got the three knuckle punch wrong it sure seemed to hurt more. Then again, since I favor a two knuckle punch I may be desensitized? Yes - we are probably not desensitized enough for wing chun type punching. My teacher used to have us do knuckle push ups where we rolled from our 3 knuckles onto the first 2 and back. Hard work, but this is the sort of thing you need to do if you're going to use your 3 knuckles with confidence. Like you, I nonetheless use the wing chun punches at close quarters but not for power punches. How do you think the Hsing I Chuan extended knuckle fits into the situation? I get the feeling that extending the 2nd knuckle of the index finger (as in Hsing I) encourages the rest of the hand to adopt the 2-knuckle alignment you mention in the article. "I get the feeling that extending the 2nd knuckle of the index finger (as in Hsing I) encourages the rest of the hand to adopt the 2-knuckle alignment you mention in the article." Great article. I always hear people quote the great Jack Dempsey on the bottom three knuckles for punching. He is correct, if I am punching someone with a completely flat face with no edges, then it would be better to use a vertical fist using the last three knuckles. HOWEVER, if you are punching a real human being to the chin, then the top two knuckles of the fist line up even better and provide more structural support. I have seen boxers advocate both the use of the top two knuckles and also the bottom three knuckles so it really depends on the camp you are learning in. I prefer a vertical punch with the first two knuckles, but even that can pose problems concerning the wrist, and requires wrist strengthening. Dan -- that's amazing you mention the action made at the end of the wing chun punch--most wing chun instructors I've seen/read about/heard of aren't even aware of it when they describe the wing chun punch. You definitely meant it when you said you had extensive training in that area. Although the wing chun punch works well at close range--better than a boxing or karate punch which are usually medium range--I prefer hammer fists and elbows. Part of that is because I feel more confident in using the meat/knife of my hand rather than the last three knuckles for a WC punch. Dempsey's comments are correct for "follow through" boxing punches. Boxers can afford to rely on the little knuckles because of the padding and strapping of their hands. Some boxers do rely on them, others have a more "street smart" view. Regardless, Dempsey's "wall test" is flawed - because of the height of the arm and the fact that a wall is flat, as you've noted! In short, this test reveals nothing other than the fact that when your arm is at a sharp angle, your little knuckles will come into contact with a flat surface first. Thanks Joshua - although I must hasten to add that I wasn't implying some sort of mastery of wing chun punches; merely that I have enough experience to see how they work. I'm with you on the hammer fist, but as I say, this is a matter of preference. When I interviewed William Cheung for radio last year I was impressed by how effective his punches were (he did some demos off-air). "agree that with a shorter punch you can hit with the last 3 knuckles, but I certainly don't think you have to." Like Bob, I would tend to hit with the last three knuckles on Close Quarter, and upper gate punches. I can't ignore the rabbit-out-of-the-hat and tactically superb reverse snap punch (what basically I train to generate most power for CQ) ... that'll land with the first two knuckles. I believe the point is missed here. The real question is why fist when you have palm heel (teisho)? You can hit as strong as with fist if not even stronger, it's way much safer in terms of injuries, and it's less noticable in terms of a surprise attack. 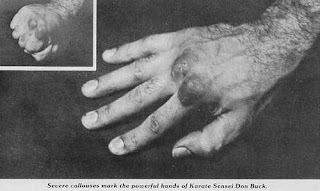 It's even known that inventors of modern karate katas introduced fist strikes in order to conceal palm heal or other more dangerous techniques. So again, why should we even think of using the fist at all? While I am a practitioner of a variety of martial arts, some of which use palm and palm heel strikes exclusively (eg. bagua) I have not, in my 30 years of experience, found a substitute for the punch. There is something about the hardness of the fist and the reduced striking surface (and corresponding increase in pressure on the target that cannot be replicated with palm/palm heel strikes. I've also found it very hard to perform certain blows (eg. uppercut) using any form of palm strike. I agree with the fact that the use of punch is an effective way of overcoming the opponent. Yet, we should be aware of its drawbacks when choosing the best possible option for self defense. Here, I'd refer to the part in your article where you mention boxers and use of gloves in their fights. How long would they fight without them? When boxers get injured the match is stopped, while in self-defense the fight goes on. Speaking about the palm heel, let me tell you about an incident I've witenssed once. Two police officers intervened in a bar incident few years ago. The guy who was making the trouble calmed down when officers arrived (he had his hands open and down to his waist). As one police officer approached the guy, obviously with intention of taking him under arm, he executed a palm heel strike (something between an upercut and round punch) to the officer's jaw immediately knocking him out. The next moment he jumped in front of the other officer and hit im again with palm heel (though this time it was more of a push than punch) in his face pushing him back off his feet onto the bar chairs. The guy then ran away. When I disregard the legal aspect of the case, it's been the most effective self defense scenario I've ever seen. Now, imagine this situation and add a punch instead of palm heel. Imagine what would happen if bone-to-bone collision after the first hard and effective punch left you with damaged knuckles and one more opponent to go. Here, I will deliberately skip describing other bloody fist fight encounters I've also seen in the past. My point is that while punch is indeed effective in terms of delivering a blow on your opponent's body, it's the associated risks that make this technique a second grade option, at least in my mind. Conditioning makes it only worse since it needs time while the need for adopting an efficient self-defense technique is basically imminent. Even then, knuckles still get damaged. I don't disagree with your points Edward. Punches do carry risks. It is for this reason that in karate and the internal arts of xingyi and taiji (among others) it is said that one should follow the "hard on soft" and "soft on hard" principle: ie. your knuckles are used for soft targets (eg. the belly), while your palm heel is used for hard targets (the chin). I know a lot of people who have damaged their knuckles doing boxing punches - a friend in South Africa who I mentioned in this article is a case in point. To offset the risk of injury, karate uses some conditioning and emphasises correct alignment. In my experience this goes a long way towards making punching effective in civilian defence. In short, I think punching with knuckles, while not the only way of striking, is indispensable in civilian defence. Another good article, Dan. How in the world do you find the time, what with work and two little ones? You're absolutely right that one needs not hit with the last three knuckles when executing a short range, vertical punch. Isshin-Ryu does it all the time. Their punches are all medium to short range, with the fist held vertically and angled in such a way that the first two knuckles are the striking surfaces. They achieve that by placing the thumb on top of the vertical fist, not tucked down and running at right angles to the fingers. The tip of the thumb then presses down on the second joint of the index finger. 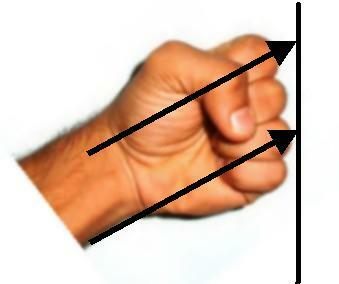 This pressure angles down the fist so that the first two knuckles naturally make contact in a strike. Although Isshin-Ryu "heiho" is to target the heart ("One heart method"), and their way of punching is geared towards this target, I recall there being plenty of head strikes in their forms. I've tried out, for the heck of it, the alignment of this fist against various surfaces of my BoB dummy. It aligns well on targets in the trunk and most of the face. I WOULD NOT want to attack the chin or jawline with it. It seems to me that even if one connects perfectly with the first two knuckles, the jawbone would dig into the depression between the second and third knuckles and cause injury. Perhaps we can get Victor Smith interested enough to comment on this. Anyway, my point being that indeed one need not hit with the last three knuckles if punching vertically at short range, but with the caveat that there are dangers associated if the target is the chin/jawline. Observation number two concerns palm heel strikes (Teisho, or shotei in Kyokushin and related styles). I've seldom used these, except as blocks. The reason for this is that, experimenting with them on a heavy bag some years ago, I wound up spraining my wrists by hyperextension backwards way too often, if striking what would correspond to torso height. This happened mostly when I inadvertantly made contact with the fingers or the upper part of the palm with the bag. In turn, that would happen if my strike was at any other angle than rising. OTOH, I work these on my BoB dummy as a self defense move, aimed at the chin or nose, with no problem. So my take is that it's usefulness is very good, if limited to harder targets at rising angles. Otherwise, the give of the target or the angle could cause wrist injury. Finally, your various comments on how the presence of gloves and wrapping distort boxing punches in comparison with bare-knuckle applications jibes with what I was told by Brad (Of TMA forums, "butterfly" at "that other place"). It turns out old Brad, in his endless curiousity about Karate and all things related, decided to train in boxing, just to see how it contrasted with, or applied to, his beloved Ashihara. He didn't last long, though, because right off the bat he landed in hot water with the trainer by questioning what was being taught. For example, he told me that one of the techniques he was taught was to defeat the opponent's guard by hook punching over the opponent's guard and downwards. So far, so good. But it went further: In order to facilitate this, you want to strike with the fist inverted, pinky finger upwards! As Brad observed to the coach, that's fine when done for match points and wearing gloves. Not a good idea bare-knuckled and for self-defense, though! you didn't understand what choson was saying, he did not say that everyone should connect with 3 knuckles, he says that his knuckles are like that because of the way he conditioned them, making his third knuckle as big as the first two, he showed this using the picture you have in this article. That's not how I understood it. As I recall he clearly implies that one should hit with those knuckles - albeit that his knuckles were particularly flat from "conditioning". However, his knuckles aren't look conditioned. They look damaged. I'd be curious to see confirmed and dispelled some of the heresay about hand conditioning. How much is safe? How much is too much? What should you absolutely NOT do?....that kind of thing.